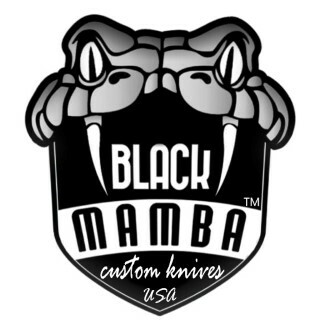 I was looking for something unique and special I could carry as my hunting knife when I found Black Mamba Knives. I liked the size and shape of the Persian Yuma with buffalo horn inlays, thinking it would be a good skinning blade, so I ordered one. Mark kept me updated throughout the process as he was handcrafting the knife. Upon receiving the knife I was impressed with the quality of the fit and finish. I wouldn’t hesitate to order again. I’m sure my hunting buddies will be jealous when they see it. The knife is gorgeous and didn’t take long at all to reach me, especially being a international order into Canada. Wonderful service and beautiful product. Knife was exceptional and really well made! Seller answered all my questions and gave me his recommendations and it was a big hit as a gift. Thank you so much! Fast shipping, and the seller is willing to work with you to solve problems. This knife is awesome!! The craftsmanship is beautiful. It came to the house in 2 days!! Got this as a gift for my nephew who is a collector. This will be his first Damascus knife and I can’t wait to see his face when he opens it. Fiance loved the early anniversary present After his pocket knife tip broke off. What do you get when you cross a jeweler with a bladesmith? You get Black Mamba Knives, and some of the finest work you’ll ever see in the art of knife making. Their name came across my desk while we were deciding who to invite to the 2018 Gear Review Expeditions. Having never seen their work, I took a look at their website, and then reached out. I’ll tell you up front, I’m glad we did. The first thing that grabs you is the beauty of the knives that Mark Kovalsky, owner of Black Mamba, makes. But it’s no wonder they are so attractive. As Kovalsky puts it, I’m a Jeweler by trade, and own a custom jewelry shop. Now it makes sense! But are they more than just eye-candy? You betcha they are! Unlike most of our Bench Tests, we put this Ka-Bar through some pretty rugged tests that are normally reserved for our Field Tests Reviews. I knew marking was wanting to know how his work stood up. The end result was that I came away feeling very confident about the knife’s performance in real-world situations. And if I’m being honest, when I first unboxed the knife the weight on it concerned me...it is light and nimble in the hand. But once I started working with the knife, I fell in love with everything about it. The stacked leather on the full tang handle is very solid, which I attribute to his attention to the assembly using the threaded stud at the end of the tang. Rocky was a bit concerned that it wouldn’t hold up when using it to strike and smash. I think I just heard Mark cringe! Don’t worry Mark, it’s as solid now as the day it left your shop. I would recommend this knife in a heartbeat...especially for bikers and military personnel. Although different in many obvious ways from the Ka-Bar, what they both have in common is quality, durability, and superb craftsmanship. The attention to even the smallest of details is evident from the point down to the pummel. In my hand the knife was well balanced with a comfortable and stable grip, giving me a confidence with this knife that it wouldn’t fatigue my hand by the end of the day. We performed the same exact tasks with the Yuma as we did the Ka-Bar...and the results were the same. Feather sticks were tight and curled, notching was very easy, and the knife stood up to some heavy battoning well. When I came back to the bench I thought it would be interesting to how the edge held up. The paper test proved my suspicions...the blade cut smooth with no rips, tears or jagged edges. Feeling down the cutting edge I could find no inclusions or burrs. Although I prefer larger knives when in the bush, the style and performance of the Yuma with its 4 1/2 inch blade wouldn’t deter me from putting on my side. It is as rugged as the Ka-Bar, and performed just as well. Oh, and did I mention how good this thing looks. And by the way, take a look at the sheath these come with. As beautiful and functional as the blades that rests in them. The Beauty of these 2 Beasts are only out-shined by their performance under tests! Out Of The Box: 1 Ka-Bar with custom Sheath. 1 Yuma Persian with custom Sheath. The Design: Ka-Bar: It’s a no brainier. If you know the classic Ka-Bar, you’ll get the design of Kovalsky’s knife. Yuma: As mentioned above, I believe the bones of the Yuma were inspired by the classic Tracker design. Features As Reviewed: Both knives are made of fine Damascus, are both full-tanged, and both come with a custom leather sheath. Other than shape and size, the difference up front on these two are their handles. One is a stacked leather system, and the other is stag with real turquoise spaces. Conclusion: The people I can see being interested in owning this knife range from serious collectors to military, to hunters and outdoors man. They’re both great as an EDC knife and would perform well in any situation where they are deployed. I’m particularly fond of the Ka-Bar because of its size and weight. I prefer the scout carry, especially when I’m on the scooter. This knife would do well for any Biker who carries knife out in the bush. It can perform tasks such as chopping, splitting, feathering, and processing game. The Yuma, it’s the Ka-Bars little brother, and the same can be said of it as well. Contact Black Mamba for more info and to order today. Lead time is about 6 weeks on all his knives. PS: I look for the price of all his knives to go up once our articles and videos become available in the late fall after our return.